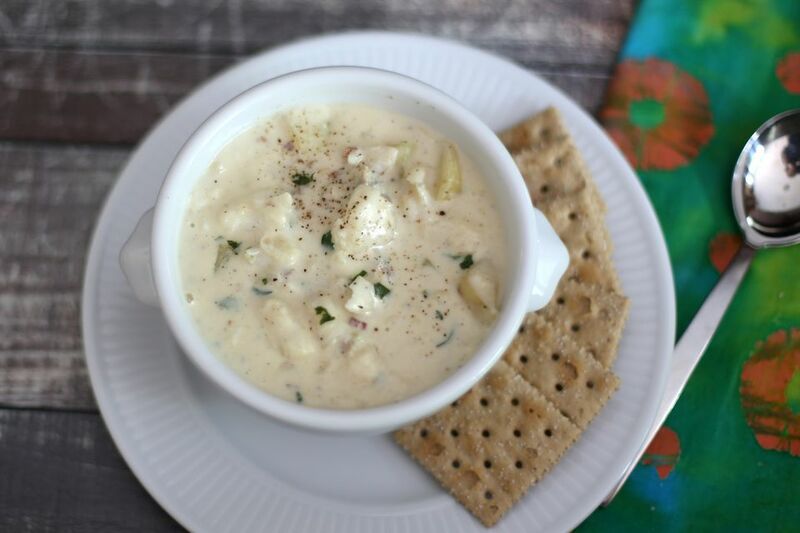 This is a top-rated fish chowder recipe with haddock or cod, seasonings, butter, potatoes, and carrots, along with onion and other tasty ingredients. While this particular recipe uses haddock, the chowder may be made with pollock, cod, or a similar white fish as well. You can also sauté the onions in bacon drippings instead of butter and then garnish with crumbled bacon for a fun and tasty twist! Cut fish fillets into small pieces; set aside. In a large saucepan or Dutch oven, combine the chicken broth, seasonings, potatoes, and carrots. Cook, covered, for about 8 minutes until vegetables are tender. Add the fish and cook for another 8 minutes. Meanwhile, sauté onion in butter until tender in a medium saucepan. Stir in flour until well-blended. Then gradually add milk, stirring constantly. Continue stirring and cooking until thickened. Add the thickened milk mixture to the cooked vegetables and fish; continue cooking for about 5 to 10 minutes, stirring frequently. Garnish the fish chowder with fresh chopped parsley or chives.